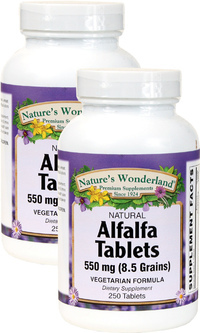 Alfalfa Tablets - 550 mg, 250 Vegetarian Tablets each (Nature's Wonderland) - Penn Herb Co. Ltd.
Alfalfa is a revitalizing green food that promotes energy, boosts stamina, supports immune function, and builds healthy blood. Early Arabians called Alfalfa the “father of all foods”, and with good reason! The herb is a remarkable nutrient storehouse of calcium, magnesium, potassium, chlorophyll, beta carotene, vitamins B-12, K and digestive enzymes. 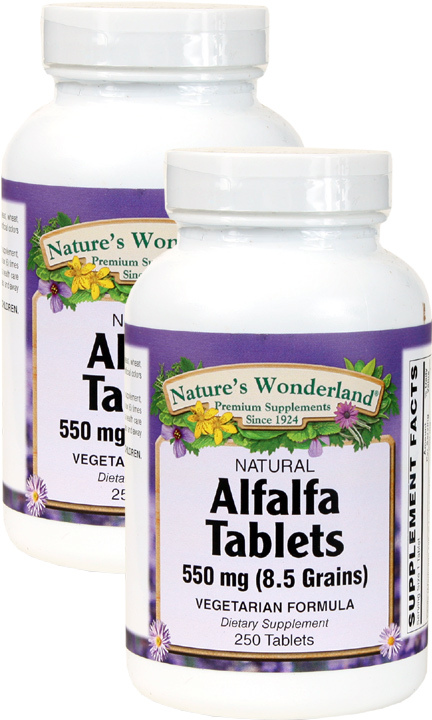 No wonder Alfalfa is the superior herbal choice for boosting vitality & well-being! Restorative tonic; promotes energy, stamina, endurance and vitality; supports healthy digestion; builds healthy blood; supports blood cleansing; soothes gastrointestinal tract. As a dietary supplement, adults take one tablet 4-6 times daily with meals, or as directed by a healthcare professional.